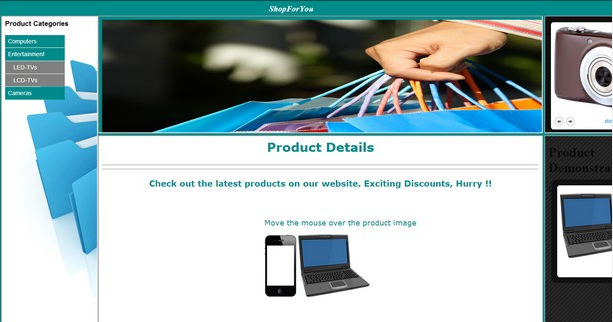 In the ShopForYou website, the Product1.png and Product2.png images display images of laptop and mobile, respectively on the product page. You need to add a feature on the website so that when a customer moves or places the mouse pointer over the image of the laptop or mobile , its detailed are displayed. 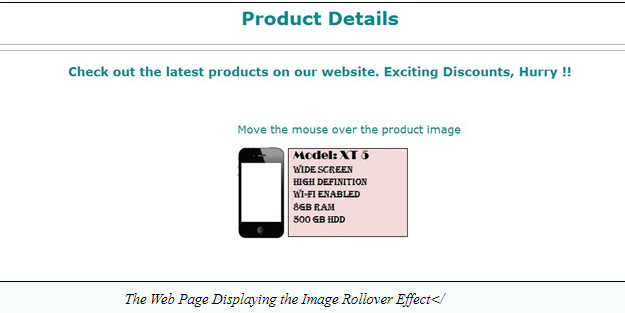 To accomplish this task, you need to add the image rollover effect to the Product1.png and Product2.png images. 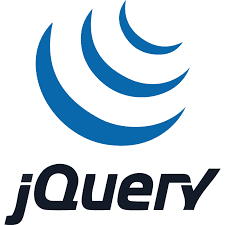 In the preceding code, two functions, over() and out(), are invoked on the onmouseover and onmouseout events of the <IMG> tag respectively The Product1.png and Product2.png images are added on the Web page by using the <IMG> tag. When the customer move the mouse pointer on the Product1.png , the over function is invoked, which changes the value of the src attribute of the image in the Web pages to Product1Details.jpg. As a result the Product1.png image is replaced with the Product1Details.jpg image. However, the customer move the mouse away from the Product1Details.jpg , the out function is invoked, which changes the value of the src attribute of the image in the document to the Product1.png image. Therefore the Product1.png image is redisplayed on the page. Similarly Product2.png image is replaced with the Product2Details.jpg image.